Helping your client go online can have many benefits. ​Eldy is a software program that actually changes the computer's interface itself, turning it into something a lot more user-friendly with a lot less options. The free software is only meant for PCs, but it's great for elderly people because it only provides six basic options, including email, internet and skype. Digital Literacy is a set of video tutorials that you can access from Microsoft's website. 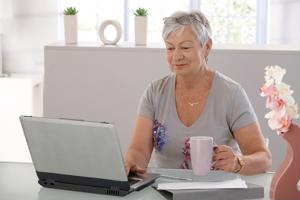 The interactive videos range from beginner to advanced, and they're a useful tool for seniors and anyone else using computers for the first time. ​Good50 is a search engine specifically designed for older users who have some vision issues. Its large font and contrast options make searching the web a little bit easier for seniors than other search engines.